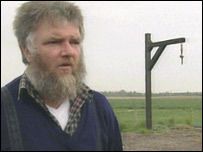 David Lucas said the sale of gallows was not "sick"
A farmer who builds gallows and has sold them to African countries with poor human rights records has been condemned by Amnesty International. David Lucas, of Mildenhall, Suffolk, said he had been selling execution equipment to countries including Zimbabwe for about 10 years. But Mr Lucas said the trade was not sick and "business is business". He added some people deserved the death penalty. Amnesty International UK director Kate Allen said: "It's appalling that a British man is apparently attempting to sell gallows to President Mugabe's government [in Zimbabwe]. "There have been gaping loopholes in the regulations concerning execution equipment for years and it makes a mockery of the UK's efforts to oppose the death penalty around the world if right under its nose a British company is sending hanging equipment abroad." An Amnesty International spokesman said the new European Commission Trade Regulation, which comes into force on 31 July 2006, will make it unlawful to export gallows.